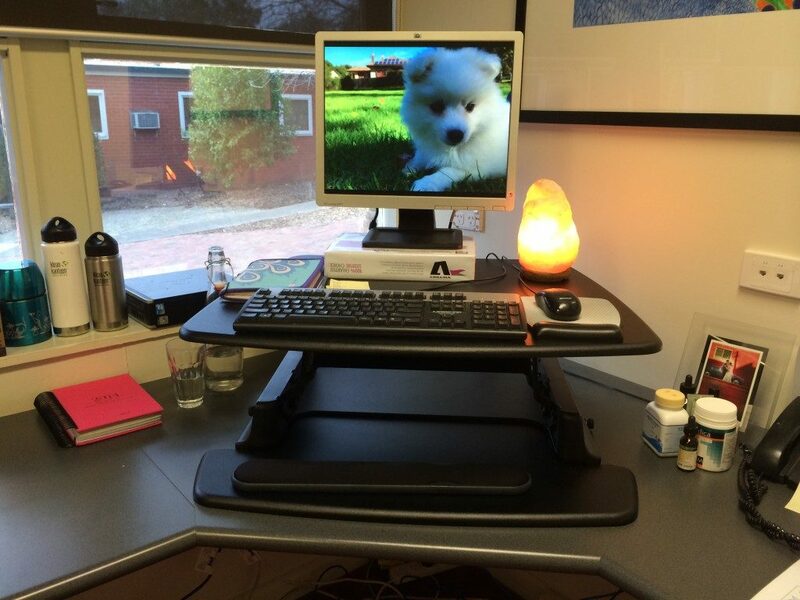 An adjustable riser standing desk converts your existing desk into a standing desk. Standing while you work (even periodically) has many proven health benefits – improved cardiovascular health, energy and mental boosts, plus potential reductions to back pain. If you can’t convince your boss to give you a fully-fledged standing desk, or you can’t squeeze one into your home office, these adjustable-height desks are the next best thing. Today, we’re comparing two similar adjustable desks: the Stand Steady X-Elite Pro and Varidesk Pro 30. They’re both solid choices, but separated by about $100 in price and a few key features differentiate them. Both of these desks are similar in price, size, and functionality. They sit atop your existing desk and support your monitor(s) and keyboard, turning any ordinary desk into a standing desk. When you get tired of standing, switching it back to the lowered “seated” position takes just seconds. Lowered position height 5" 8"
Both desks go to about 15″ high (be warned, they get wobblier the higher you go). 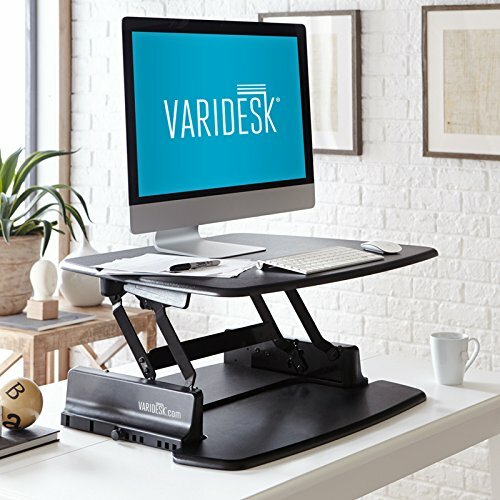 The X-Elite Pro can be locked at any position between its flat position (5″) and its max height (15″), and the Varidesk has the same range and can be stopped at any of 11 set stopping points. The thing to think about here is how tall your existing desk is. Use our guide to find your ideal standing desk height, then use the heights of your existing desk and your adjustable riser to figure out if it’ll be a good height for you. Both desks come completely assembled, just plop ’em on your desk. They are, however, rather heavy – 30 or 40 lbs each. You may want a helper to help you place your adjustable desk onto your existing desk. Depending on the size of the monitors, you can cram as much as two monitors, a keyboard and mouse with a little room to spare. You can probably fit two 20″ monitors, but two 24″ wouldn’t fit unless one is rotated vertically. A laptop would fit easily, but you’ll want to prop it up on something and use a different keyboard for better ergonomics. This Varidesk Pro 30 action shot from coachkate.com shows the Varidesk Pro 30 in use with a small flat panel monitor atop a ream of printer paper, a 20″ keyboard, and mouse. Both desks have a pump assist for lifting and dropping (like an office chair). Lifting the desk surface does require some mobility on your part – you’ll have to lean over it and squeeze the handles to lift or lower the desk. 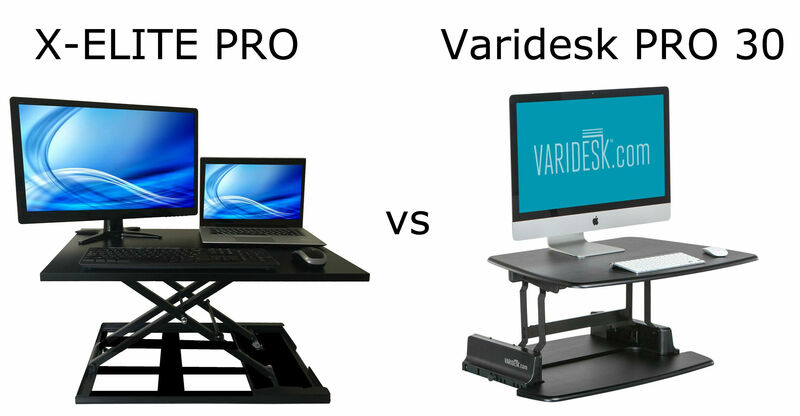 The X-Elite Pro is a bit shakier compared to the Varidesk, which is heavier a little less shaky when typing. Both will shake more or less depending on how hard you type. Neither desk is wide enough to place anything (a notebook, stack of documents, etc) adjacent to a keyboard and mouse. The X-Elite Pro sits about 5″ above the surface of your desk when lowered. The Varidesk Pro 30 sit about 8″ higher than the surface of your desk when lowered (with a keyboard pullout tray). You might need to raise your chair up a bit to compensate for this default height with either desk. There is, however, a little trick you can do with the X-Elite Pro. You can remove the pin that prevents it from laying completely flat. The catch: the hydraulic lift assist only kicks in at 5″ and higher, so the first 5″ of lift will be unassisted if you do this. The Varidesk Pro 30 has a nice slide-out keyboard support tray. This is nicer than the X-Elite Pro’s “all on one surface” design because it lets the rest of the Varidesk Pro desk act like a monitor stand, while your arms can rest comfortably lower than the monitor’s base. Here’s the Varidesk Pro 30 in the lowered position. Note the pull-out keyboard tray in front! 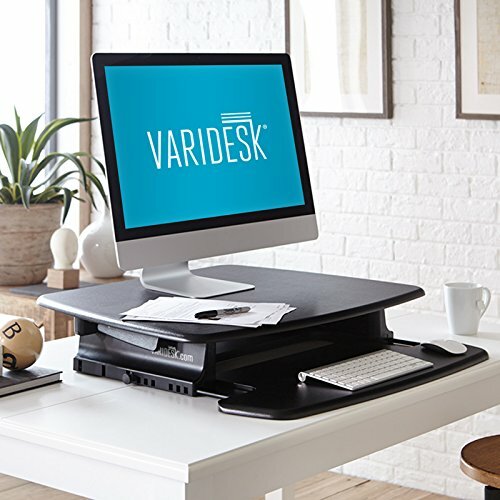 The Varidesk Pro is our top pick between the two. The X-Elite Pro is a fine choice, but we think this is one of those times where it pays to pay a little more. The Varidesk Pro is sturdier and larger, and the keyboard tray improves its ergonomics while using it seated. The Varidesk Pro 30 won us over with better stability, a higher weight capacity, and ergonomic pullout keyboard tray. Hi, I’m Dora with Loctek, a company offers ergonomic solutions such as sit-stand desks and monitor mounts. We just launch a new series of sit-stand laptop mount which is a convenient and affordable way to convert traditional desk into standing up desks. Are you interested in reviewing our sit-stand products? Any suggestions for seniors with minor disabilities?